Aubergines! Why oh why have I never made a recipe for you lovely lot with Aubergines? It has to be said that I absolutely love them, whether just on their own or mixed up with other flavours. As some of you may have noticed I love versatile foods and Aubergines are exactly that: use them for texture, to thicken, to make sauces silky smooth or chuck a load of bold flavours at them to make your dishes super tasty. You can even make some uber healthy ‘burgers’ by just slicing them up and grilling the bajeebus out of them with a touch of cayenne pepper. 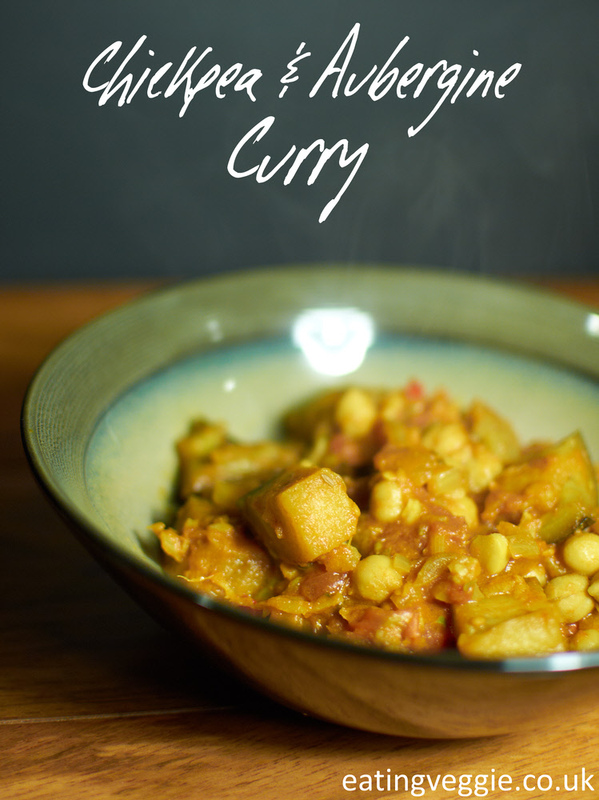 This curry is super easy and really frugal to, perfect for those mid-week, end of month, pre pay-day what-the-hell-is-for-tea moments. Heat the oil in a large shallow pan over a medium-high heat, I like to use a wok, then add the onion and aubergine. Fry until the onions just start to turn golden. Whilst thats frying, in another, small, pan lightly toast the cardamon and cumin seeds for 1-2 minutes until you can start to smell them, remove and give them a good grind in a pestle and mortar with the other spices. Add the garlic, ginger and fresh chilli to your onion and aubergine, stir well and cook through for 3-4 minutes stirring now and then. Add the spices, stir thoroughly then add a drop of water to stop them from burning. This is a handy tip when cooking quick curries on a high heat with dried and ground spices, at the first sign of them burning/catching add a little bit of water to the pan to cool things off. Add the chickpeas and combine everything together, cook together for a couple of minutes then add the chopped tomato. Simmer everything together for about 8 minutes, add a drop more water if you like things saucy! Serve with rice or indian breads and enjoy! You certainly can! Not perhaps in this recipe so much, but if you roast them on a high heat to the point where they start to burn, cool then peel off the skin, mash up the flesh and add it to curries, tagines, pasta sauces or whatever you like really. Adds a slightly sweet earthy flavour, a nice velvety mouthfeel and helps to thicken everything up :).